Arrival to Lima, founded 1535 by the Spanish conqueror Francisco Pizzaro. Here, guests will encounter colonial richness and the vibrating vitality of a modern city. In the morning market visit with a local chef who will explain about local fruits and vegetables. After that, the chef will make a demonstration on how to prepare the famous “ceviche” and “lomo saltado”. Guests will enjoy the same dishes for lunch. City tour through the colonial and modern districts of Lima and visit of the San Francisco Monastery. 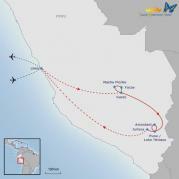 Flight to Cusco, the „Navel of the Earth“. Walking city tour including visit of the impressive ruins of Sacsayhuaman in a private van. A shaman will welcome the guests with a ceremony called “pago a la tierra” (payment to the earth). Visit to the popular market of Pisac. With some money and a list of the most important vocabulary, guests bargain with local vendors to see, who can buy the most goods for their money – good luck! The purchased food will be donated to a local family. Transfer to the Andean community of Amaru. Various families will offer a bed in their houses and invite guests to enjoy a local dinner with them. After breakfast guests will learn the ancient technique of flat weaving, shearing the wool, natural dyes and the spinning. For lunch the typical dish “La Merienda”, made with guinea pig, dried meat, corn tortilla, quinoa, cheese or other fresh products, will be served. Transfer to the hotel in Yucay. Visit the typical and rural village of Maras. A group of villagers will introduce the guests in several workshops to their culture, customs and traditions. Each group will be assigned one Spanish speaking “teacher”, a guide will assist and translate. After a local lunch guests will visit the salt mines of Maras. Transfer by Vistadome train and shuttle bus to the famous ruin site of Machu Picchu. Guided visit of the ruins. In the afternoon return by bus and train to Cusco. Visit of the chocolate museum. In a chocolate workshop guests will put together their very own chocolate bar with the ingredients of their choice: almonds, nuts, coffee beans... During the time the chocolate will harden, guess will taste some chocolate tea brewed from the husks as well as some fresh hot chocolate (day's recipe). The afternoon is at leisure. Transfer to Puno. En route visit the Racchi ruins, the best and – to this extent – only surviving ruins that have adobe walls still sitting on a base of Inca rock walls. Guests will be welcomed by the local community, who will share a home-cooked lunch and insight in the local traditions and customs. Boat excursion to the floating Islands of Uros and the Island of Amantani. Lunch, dinner and overnight in the Amantani community. Visit of the Taquile Island, which was part of the Incan Empire and has a number of Inca ruins. Lunch included. The Taquile people have maintained their traditions and culture and many locals wear traditional clothes. After lunch return to Puno. On the way to the airport of Juliaca, guests visit the house of a local farmer and his family to learn about their everyday life like tilling the small fields or cooking in the outside oven. Flight to Lima. In the evening, guests drive to a local restaurant to celebrate the night with a nice farewell-dinner. Transfer to the airport for individual homebound flight.